For hardware enthusiasts, Futuremark is a brand name synonymous with benchmarking. The 3DMark and PCMark series of benchmark suites were the essential workouts for any PC gamer with a penchant for overclocking and/or spending ridiculous amounts of money for the purpose of enlarging their PC's numbers. Futuremark’s latest benchmark creation, 3DMark Vantage, proved to be something of a flop. Previous iterations of the 3DMark benching tool were simple and intuitive. At the end of a run you were given a number which could be measured against that of your peers. Vantage however was confusing and compartmentalised, a fact ensured that 3DMark06 is still the 3D benchmark of choice for many enthusiasts. When the company announced it was working on an actual game, it resulted in almost as many pairs of rolling eyes as the announcement of Microsoft’s new Bing search engine. It was suspected that the move to game development was a desperate attempt to salvage some kind of credit (financial and otherwise) from the ground lost on release of the irksome 3DMark Vantage. When more details surfaced of about Shattered Horizon though, one thing became very clear. Futuremark was taking an altogether original angle for their debut game release. While there’s nothing original about team-based, mutliplayer first person shooters, Shattered Horizon is multiplayer only and set entirely in a zero gravity environment. 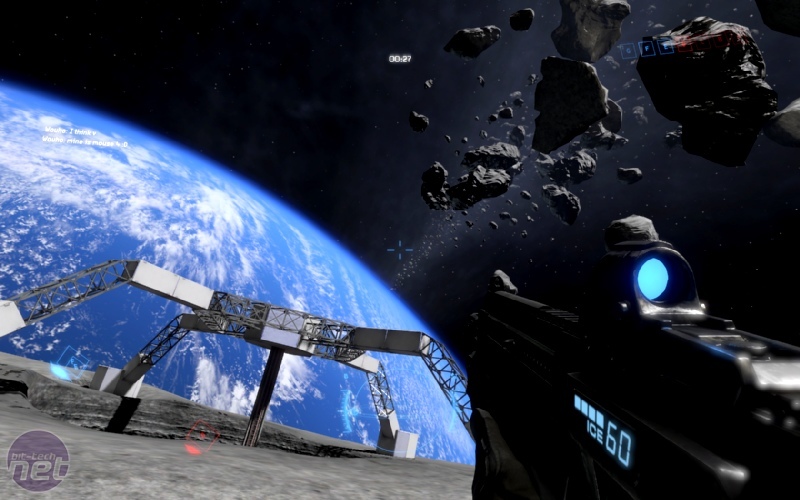 While there have been elements of zero-g in titles such as Unreal Tournament and Quake, the theme is a ubiquitous one in Shattered Horizon. It's set 40 years from now and man has started mining the moon. The unambiguously named Moon Mining Corporation (MMC) has started amassing epic wealth from the escapades of its name sake and we doubt it’s from selling moon rocks as souvenirs. Much like any other mega-corporation, the MMC got greedy, resulting in a whoopsy of cataclysmic proportions. A huge explosion that nigh-on tore the moon asunder scattered giant moon rocks towards Earth’s atmosphere, settling in an arc of debris that orbits the planet. Being the ingenious creatures that we are, Earth’s population dubbed the arc of debris... The Arc. Not only did the explosion hurtle rocks into Earth’s orbit, it also sent them crashing into the International Space Station. 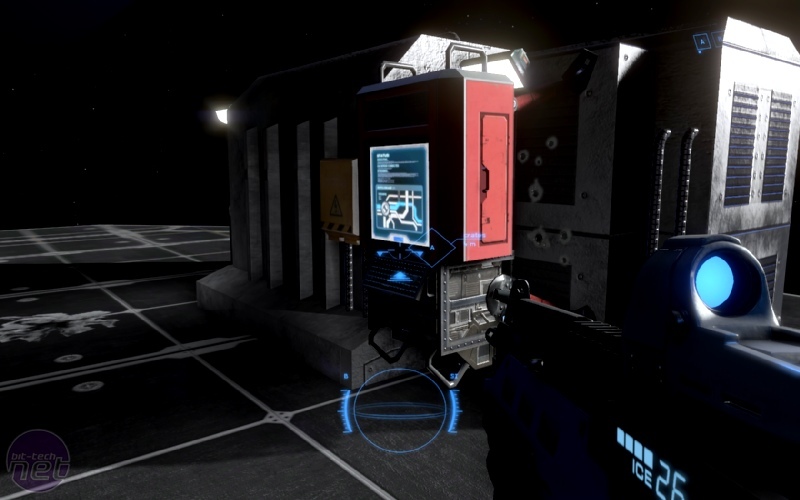 The levels based around the space station are modelled on the real ISS, except with about 40 year’s worth of upgrades added on. The manned space station is owned by the equally unambiguously named International Space Agency (ISA). Facing a royal spanking from the authorities back down on earth, the MMC decided that its only course of action is to live as a self-sufficient atmospheric outcast. Returning to the surface for the sore bottom that it so rightly deserves for causing such a kerfuffle would be a terrible fate. However, getting supplies to the chaps caught in The Arc from Earth is something of a logistical challenge, and the last aid the inhabitants of the ISS received were a bunch of guns so that they might wrestle the MMC to justice. The opposing fronts now battle it out for supplies and key strategic points in a never-ending zero-g ballet of gunfire and double-barrel colostomy bags. The first last and only defence against the scum of the universe. We sit down with the Shattered Horizon team over at FutureMark, quizzing them about the challenges of making a FPS in zero-gravity, creating a believable sci-fi game and using lighting engines to create a unique atmosphere in a game. Check it out!